KSEB SMS alert – the new step of Kerala State Electricity Board towards becoming more consumer friendly. 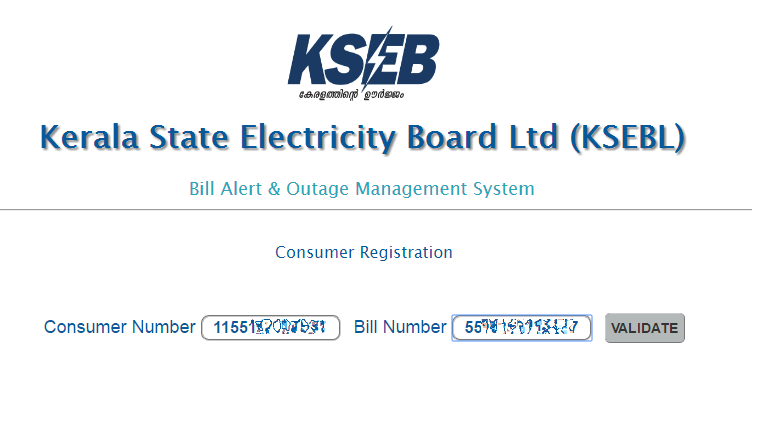 Consumers can now register their mobile numbers in KSEB website to receive alerts in advance regarding any kind of power failures which are pre-planned by SMS on their mobile numbers. 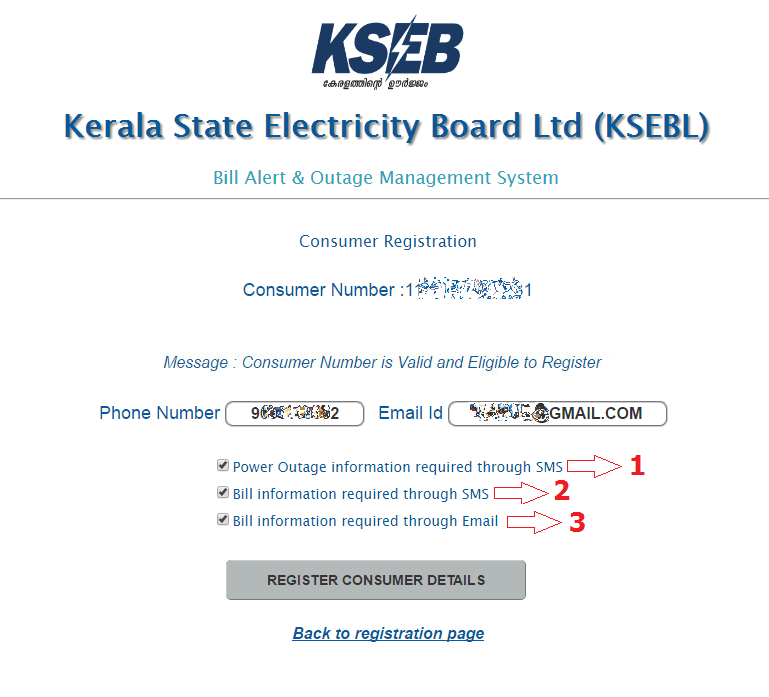 Consumers can register their e-mail addresses also in KSEB website for receiving above said alerts through e-mail. Follow below link to visit KSEB SMS alert registration page. On the first screen, fill up your 13 digit consumer number and latest KSEB electricity bill number and click “Validate“. 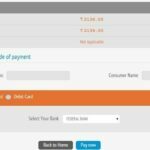 Follow below link to read instructions about how to view your KSEB bill, if you don’t know your bill number. On the next page, fill up your 10 digit mobile number and your e-mail id. If you are a registered user, your e-mail and mobile number will be displayed there automatically. 2) Bill information required through SMS. Check this if you want to receive SMS alert when a new bill is issued by KSEB. 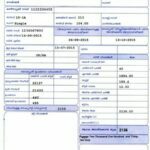 3) Bill information required through e-mail. 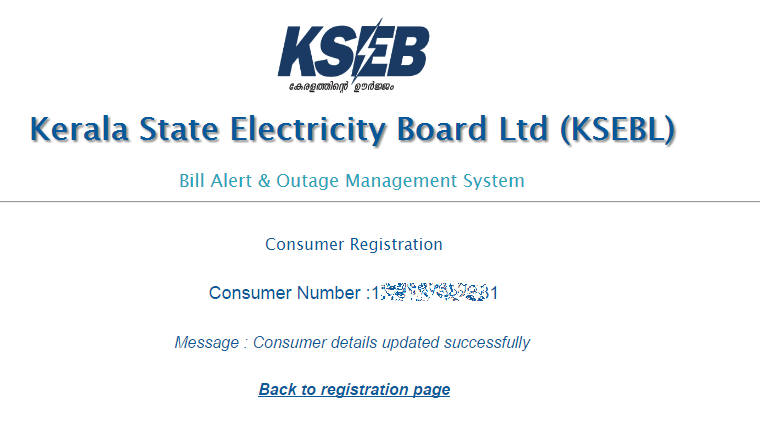 Check this if you want to receive e-mail alert when a new bill is issued by KSEB. 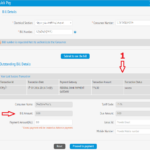 After filling up and selecting abovesaid details, click ” Register Consumer Details “. If you are a registerd member, the button text will be “Update Consumer Details “. If the registration process for KSEB SMS Alert is successful, a success message like the above screenshot will be displayed. Your subscription process to receive KSEB SMS alerts is now complete. From now on, if there is any kind of pre planned power failures such as maintenance works, load shedding etc, you will get SMS alerts from Kerala State Electricity Board.